The NAEW&C Force provides a multinational and immediately available airborne surveillance, warning and control capability in support of NATO’s objectives. The Force takes its operational directions from and reports to the NATO military command structure but depends upon NAPMO for E-3A fleet modernisation, maintenance, and sustainability. NAEW&C Force exercises operational control over the Force consisting of two operational elements - the E-3A Component operating 16 E-3A aircraft from the NATO Air Base (NAB) located at Geilenkirchen, Germany, and the E-3D Component operating seven E-3D aircraft from Royal Air Force (RAF) Waddington, the United Kingdom. The Force also maintains three Forward Operating Bases (FOB) at Trapani, Italy; Konya, Turkey; Aktion, Greece, and one Forward Operating Location (FOL) at Oerland, Norway. 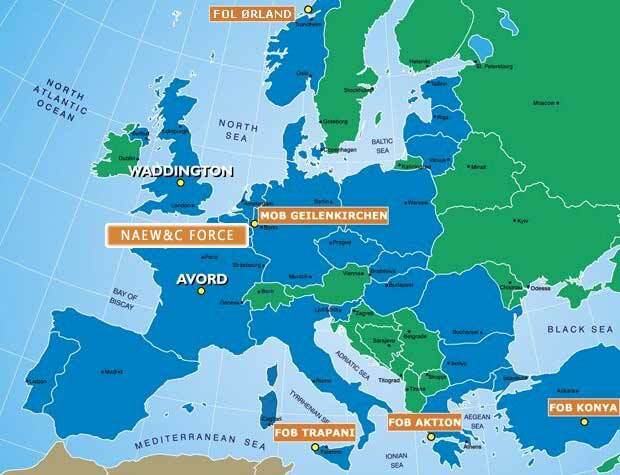 The NAEW&C Force Headquarter is hosted with the NE-3A Main Operating Base, Geilenkirchen, Germany with the post of the Force Commander (Major General) alternating between Germany and the United States, and the Deputy Force Commander assigned to the United Kingdom. The Headquarter staff consist of approximately 100 military and civilian personnel from all participating Nations and is responsible for operational planning and evaluation, requirements definition and budgeting, logistics, and Communications and Information Systems (CIS).